The singular cause of these ruptures to people’s lives, and to their relationships with their natural and social habitats, is the failure of governments to apply a justice-based pricing system. If the value created by infrastructure is not collected to fund their capital costs, it does not go begging. It is collected through the land market, which is the mechanism for measuring the value of a bundle of such services in each location. The inter-personal injustices emerge on a nation-wide – and even a continent-wide – scale. Resources are extracted from peripheral regions and employed in higher productivity locations. This process is Ricardo’s Law at work, leading to concentrations known as “agglomeration” (Harrison 2006a). Because tax policy favours high value locations, society is carved up in ways that prejudice the essence of what it means to be human. 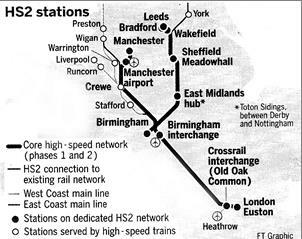 An example is the fiasco associated with the proposal for a high speed railway (HS2) in Britain. The Cameron Coalition government argues that cutting the travel time to the north of England for businessmen would yield massive gains. But the net benefits would be captured by commercial enterprises in the South-East. Reducing the costs of doing business with other regions works to the advantage of businesses in London. That outcome does not feature in the cost/benefit analyses published by the government, which is not even sure how much the investment would cost taxpayers (one estimate puts the cost at £80bn: Watts 2013). Reclusive localism is not the answer. Few people wish to live isolated lives. Life is enriched when communities are linked by roads and railways. The pricing mechanism that required people to pay for the services they used would yield the correct balance between spatially distributed resources and communities.